It's not every day that the U.S. Department of Homeland Security revokes a visa issued to a Swiss-national scholar scheduled to teach at one of America's premier universities. But this has just happened, and it's a good thing too. The Swiss scholar is Tariq Ramadan. He is Islamist royalty – his maternal grandfather, Hasan al-Banna, founded the Muslim Brotherhood, probably the single most powerful Islamist institution of the twentieth century, in Egypt in 1928. Tariq is a Swiss citizen because his father, Sa'id Ramadan, also a leading Islamist, fled from Egypt in 1954 following a crackdown on the brotherhood. Sa'id reached Geneva in 1958, where Tariq was born in 1962. Thanks to his pedigree and his talents, Tariq has emerged as a significant force in his own right. Symbolic of this, Time magazine in April named him one of the world's top hundred scientists and thinkers. And so, when Notre Dame University went looking for a Henry R. Luce professor of religion, conflict and peacebuilding, it unsurprisingly settled on Mr. Ramadan. Its offer was made and accepted by the beginning of 2004; a work visa followed in February. Mr. Ramadan bought a house, found schools for his four children, and dispatched his personal effects to South Bend, Indiana. He was supposed to start teaching a few days ago. But on July 28, just nine days before the Ramadans were to leave for America, Mr. Ramadan was informed that the Department of Homeland Security had revoked his work visa. A DHS spokesman, Russ Knocke, later explained this had been done in accord with a law that denies entry to aliens who have used a "position of prominence within any country to endorse or espouse terrorist activity." The revocation, Mr. Knocke added, was based on "public safety or national security interests." Of course, Mr. Ramadan dismisses the revocation as "unjustified" and due to "political pressure." He even blames me for the DHS decision. He has praised the brutal Islamist policies of the Sudanese politician Hassan Al-Turabi. Mr. Turabi in turn called Mr. Ramadan the "future of Islam." Mr. Ramadan was banned from entering France in 1996 on suspicion of having links with an Algerian Islamist who had recently initiated a terrorist campaign in Paris. Ahmed Brahim, an Algerian indicted for Al-Qaeda activities, had "routine contacts" with Mr. Ramadan, according to a Spanish judge (Baltasar Garzón) in 1999. 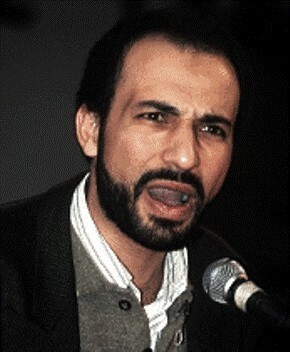 Djamel Beghal, leader of a group accused of planning to attack the American embassy in Paris, stated in his 2001 trial that he had studied with Mr. Ramadan. Along with nearly all Islamists, Mr. Ramadan has denied that there is "any certain proof" that Bin Laden was behind 9/11. He publicly refers to the Islamist atrocities of 9/11, Bali, and Madrid as "interventions," minimizing them to the point of near-endorsement. Intelligence agencies suspect that Mr. Ramadan (along with his brother Hani) coordinated a meeting at the Hôtel Penta in Geneva for Ayman al-Zawahiri, deputy head of Al-Qaeda, and Omar Abdel Rahman, the blind sheikh, now in a Minnesota prison. Mr. Ramadan's address appears in a register of Al Taqwa Bank, an organization the State Department accuses of supporting Islamist terrorism. Then there is the intriguing possibility, reported by Olivier Guitta, that Osama bin Laden studied with Tariq's father in Geneva, suggesting that the future terrorist and the future scholar might have known each other. Ramadan denies all ties to terrorism, but the pattern is clear. As Lee Smith writes in The American Prospect, he is a cold-blooded Islamist whose "cry of death to the West is a quieter and gentler jihad, but it's still jihad." These reasons explain why Americans should thank DHS for keeping Tariq Ramadan out of America. But the story is not over: the State Department has in effect encouraged Ramadan to reapply for a different type of visa, making the recent developments probably just round one of a drawn-out match. For more on Ramadan's visa revocation, see the excellent articles on him by Fouad Ajami, Stephen Schwartz, and Daniel Johnson. "Tariq Ramadan, the Chicago Tribune, and Me." Provides a running account of my disputes with Ramadan, many of them concerning the Chicago Tribune, but some not, in the period August-December 2004. "Tariq Ramadan Gives Up - Then Tries Again." Picks up the issue of Ramadan's U.S. visa in December 2004 and follows him as he alternately stops trying to get into the United States, then legally challenges his exclusion. "Tariq Ramadan Exposed." Looks at Ramadan's little problem at with the truth involving the Italian magazine Panorama. "Is Tariq Ramadan Lying [about Magdi Allam]?" dissects Ramadan's strange accusation against me and finds that, "as so often is the case with Islamists and other totalitarians, the accuser himself stands accused." Responding to Joshua Muravchik about "Moderate Islamists"